It is a privilege to get the opportunity to participate in the promotional tours, awards ceremonies, film festivals, book appearances, phoners and other lucky happenstances that feature the notable among us. To whittle down the list, I mostly thought about what was said in these interviews, whether inspirational or provocative – plus the status of the participants, whether they are up-and-coming or established. The interview highlights are broken down by “Background and Behind-the-Scenes” and the “Memorable Quote” associated with each subject, and are often accompanied with exclusive photography by Joe Arce of HollywoodChicago.com. Four notables who just missed the list include (click the name) Greg Kinnear, Crispin Glover, Andy Garcia, John Turturro, and Joel Murray. The following list represents the films, events and nostalgia of 2014. 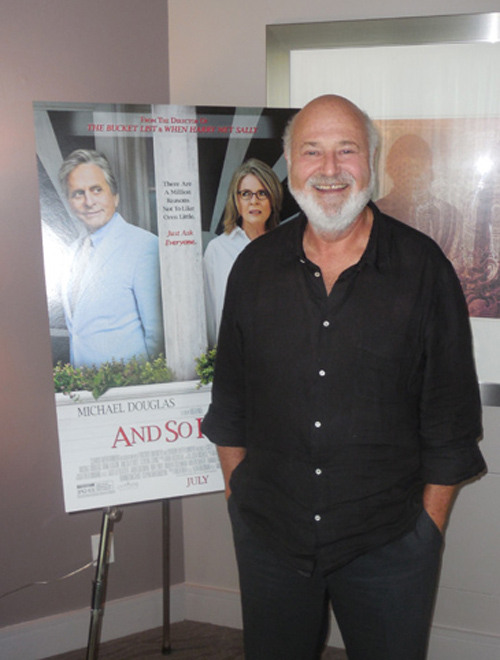 Background and Behind-the-Scenes: One of the great voices in modern American film directing came from a TV sitcom star from the 1970s – Rob Reiner. The son of famed TV producer and filmmaker Carl Reiner, Rob was best known for playing “Meathead” Mike Stivic on the controversial TV series “All in the Family.” He was in town promoting his latest film, “And So it Goes,” but I was just as fascinated with his years on that sitcom as I was with “The Princess Bride” – among his stellar filmography. He didn’t disappoint in any reflection. Click here for the full interview of Rob Reiner. Background and Behind-the-Scenes: “Life Itself,” the brilliant document of film critic Roger Ebert’s life, is not only the front-runner for Best Documentary at the Oscars, but is also a passion play for it’s creators – Chaz Ebert, producer and Roger’s wife, and Steve James (“Hoop Dreams”), the director. As an acquaintance of both individuals, the interview was more of a celebration of Roger’s life and what it meant to all of us. As long as I’m a film critic, I will always owe a debt of gratitude to RE, and as follows his brilliant biographers, Chaz and Steve. Click here for the full interview of Chaz Ebert and Steve James. Background and Behind-the-Scenes: I’ve been fortunate enough to meet some true legends of cinema, and they don’t get more legendary than Liv Ullmann – filmmaker, actress and muse to director Ingmar Bergman. Attending the 50th Chicago International Film Festival for her new film “Miss Julie,” Ullmann sat down for a few nerve-racking (for me) questions, and gave some special insights to the life and times of her legacy. Speaking to her was a blessing. Click here for the full interview of Liv Ullmann. Background and Behind-the-Scenes: Schwartzman was in Chicago promoting his underrated film “Listen Up Philip,” and he was an amazingly personable and warm interview subject. He was engaged and enthusiastic, and it wasn’t an act. He is, of course, a stock performer in Wes Anderson’s universe, who gave him his first big break in “Rushmore,” and did you know he was the son of actress Talia Shire (“Rocky”)? Our interview was a crazy quilt of his love for portraying authors like Philip and his adventurous career. He is a real treat of a human being. Click here for the full interview of Jason Schwartzman. Background and Behind-the-Scenes: This was a film that made my Top Ten List for 2014, and it’s an inspiration both for the events it portrays – the voting rights march in Selma, Alabama, circa 1965 – and the man who led that march, Dr. Martin Luther King Jr. The actor David Oyelowo imbued his portrayal of Dr. King with a humanity that brings the icon to life, and the director Ava DuVernay – who is directing her first major film – gives a balance and reverence to the events as they unfolded. A must-see for soul cleansing, especially in the light of Ferguson and New York City. I spoke with the creators of this film via phone in mid-December, and their feeling and truth came through the distance. Click here for the full interview of Ava DuVernay and David Oyelowo. Background and Behind-the-Scenes: Why this director ends up in my “hot six” for 2014 interviews, became clear as we spoke. Miller is a intuitively honest man, and it was obvious he was not up for my analytic questions about his new film “Foxcatcher” or the legacy of his close friend, the late Philip Seymour Hoffman – the lead actor in Bennett’s “Capote.” It was refreshing to experience his complexity and his truth. Finally, somebody calls me on my bullsh*t.
Click here for the full interview of director Bennett Miller.